I had to look that one up. One of our awesome architects here at Salesforce, Peter Wisnovsky, came up with it. Quiddity is defined by Wikipedia as the essence of an object. Literally its "whatness" or "what it is". What the?! Why not just call it 'type', 'category', or 'dimension'? I asked Peter and he told me that 'type' was too overloaded. I personally just think it's because 'type' was too boring whereas 'quiddity' is supercalifragilisticexpialidocious! Regardless it turns out that understanding an Apex class's quiddity is pretty important when determining whether you've hit the synchronous concurrent Apex limit. "The Concurrent Apex Limit is the number of synchronous concurrent requests for long-running requests that last longer than 5 seconds for each organization. If more requests are made while the 10 long-running requests are still running, they’re denied. Of which, each org has a limit of 10." "Unable to Process Request. Concurrent requests limit exceeded. To protect all customers from excessive usage and Denial of Service attacks, we limit the number of long-running requests that are processed at the same time by an organization. Your request has been denied because this limit has been exceeded by your organization. Please try your request again later." There's a great blog post on the engineering developer blog by the former blimp pilot, John Tan, that goes into more detail about what this limit is and how to work with it. 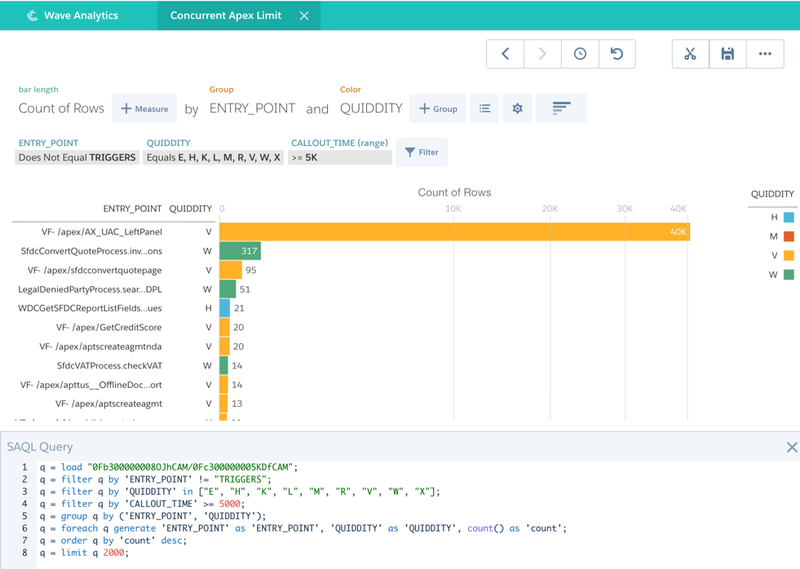 The quiddity log attribute is key to unlocking an Event Monitoring query to find out which Apex classes have the potential to hit the concurrent Apex limit in your org. Well, that's pretty darn useful, so we added the quiddity attribute to the ApexExecution file type in the Spring '16 release. 1. High callout time <--- Probably the most common cause! If the cause was a high callout time, you can filter your ApexExecution file based on QUIDDITY (E, H, M, R, V, W, X, L, K, or I) and CALLOUT_TIME (>5000), both of which were added in the Spring '16 release. If the cause was a high db time, you can filter your ApexExecution file based on the QUIDDITY (E, H, M, R, V, W, X, L, K, or I) plus where RUN_TIME>5000. 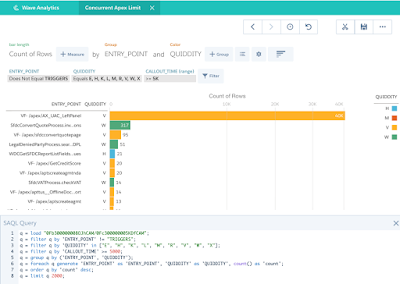 This won't exactly tell you where you did hit the limit, but it will at least identify which synchronous Apex classes run longer than five seconds and probably should be optimized using the tips provided John's blog post. In addition to quiddity, we also added EXEC_TIME to ApexTrigger files in order to get the run time of each trigger execution instead of RUN_TIME which turns out not to store any values in production. Who knew? !